If you follow my blog, you know that Sunday morning breakfasts are a real favorite of mine. I’m always looking for new ways to present old favorites. I decided to cook the French toast in muffin pans which made a very nice presentation. If you are having a brunch party, this is a great way to create individual servings. To get started, preheat the oven to 375 degrees F. Grease a 12 cup muffin pan with butter. 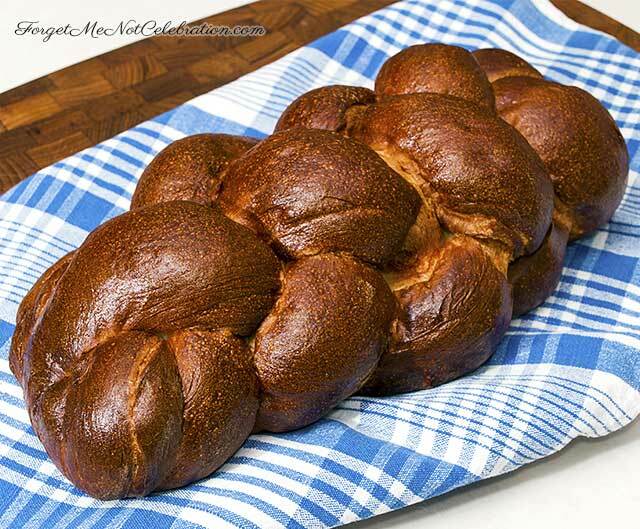 Cut eight 3/4″ slices of Challah bread. Cut the slices into 1/2″ cubes. In a large bowl, beat together the eggs, milk, half and half, brown sugar, white sugar, vanilla, cinnamon and nutmeg. Add the bread cubes and let the bread soak until most of the egg mixture is absorbed. Spoon the mixture into the prepared muffin cups. In a small bowl, mix together maple syrup, brown sugar and cinnamon. Spoon this mixture over the top of the French toast. Bake the cupcakes for 20-25 minutes until each is puffed and golden. 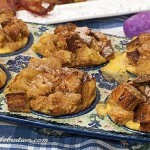 When removed from the oven, sprinkle the top of each of the Challah French toast cupcakes with cinnamon sugar. Cut eight 3/4" slices of Challah bread. Cut the slices into 1/2" cubes.